At the end of May, Shamyra Lee took her oldest son, Malachi, to the doctor for his annual wellness check-up. What was supposed to be a routine appointment turned into one of the most frightening days of her life when the doctor discovered an abnormal heartbeat. Ten-year-old Malachi spent five days in Phoenix Children’s Hospital, and was eventually sent to UCSF in San Francisco – far from his hometown of Chandler, Arizona – for one month, where he underwent countless tests and procedures. All the while, Shamyra was 37-weeks-pregnant with her third child and unable to travel to be with him. While Malachi was at UCSF, a lung biopsy diagnosed an extremely rare form of pulmonary hypertension called pulmonary capillary hemangiomatosis (PCH). 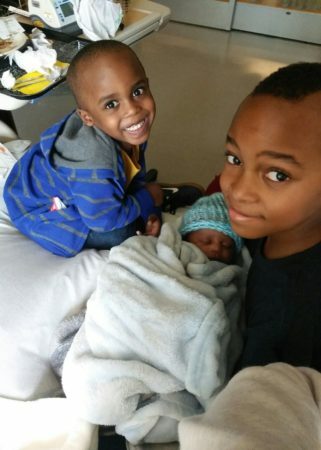 During that time, Shamyra’s third son, A.J., was born in Arizona. 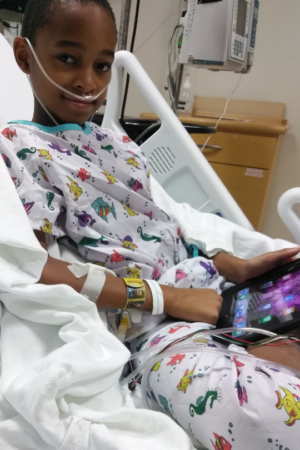 Four weeks later, Shamyra and her three sons, Malachi, Lemar and A.J., traveled to St. Louis so that Malachi could be listed for transplant. Unfortunately, her husband, Anthony, had to stay in Arizona for work. “Our whole world was flipped upside down,” says Shamyra. Shortly after arriving in St. Louis, the Lee family moved into the Ronald McDonald House on West Pine, just down the street from St. Louis Children’s Hospital. One month later, they moved into an RMHC long-term apartment adjacent to the Ronald McDonald House – a more comfortable space for four people to reside over an extended period. Malachi was placed on the transplant list on July 27, 2018 and received his new lungs just over two months later on October 5. The added privacy of the RMHC long-term apartment is especially important now, as Malachi recovers from the transplant for a minimum of 90 days, when his immune system is suppressed and his surroundings must be as hygienic as possible.